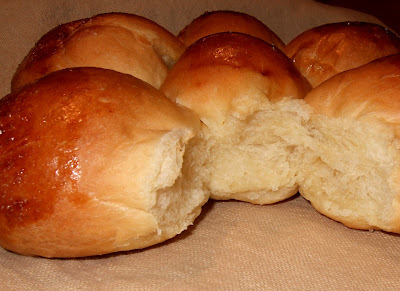 These delicate buttery rolls are soft and sweet. They are basically a type of brioche, or sort of a Czech kolach. They are wonderful on their own and even better with sweet butter and strawberry jam. The recipe is interesting enough, and you will want to make these, but what I really want to tell you about regarding Jacob Tofer's yeast cake is the medium of recipe transmission. 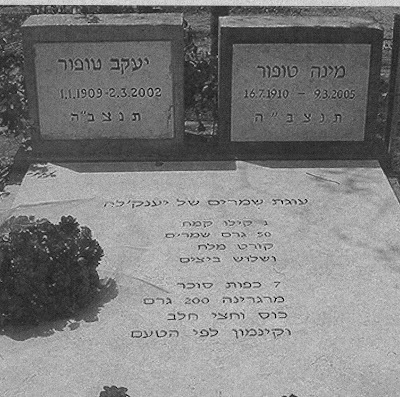 This recipe, and only this recipe, is inscribed on the tombstone of Jacob and Mina Tofer in Kibbutz Na'an in Israel. Were they parents and grandparents? Did they survive the war in Europe? I understand that they did, but Jacob was famous for his yeast cake and wanted to be remembered for that, and you see; it worked. I never met the Tofers, but I will remember them every time I make their rolls. 1 kilo flour, 50 grams yeast, A pinch of salt,3 eggs, 7 spoons sugar, Margarine, 200 grams, A cup and a half milk, and cinnamon to taste. No directions are provided, possibly because the assumption is that anyone sufficiently motivated to prepare a recipe discovered in a cemetery will already know how to prepare this kind of bread, and of course a tombstone provides limited space. I have converted the recipe to English measurements and made a few minor changes. I added some water in which to dissolve the yeast, increased the salt significantly and substituted butter for margarine. Even in the interest of historical accuracy, I cannot bring myself to use the M-ingredient (And what is margarine doing in a milkhik recipe anyway? There is already a cup and a half of milk in here, for crying out loud). Let’s see, anything else? Ah yes. Cinnamon to taste, for me, means no cinnamon at all. In the bowl of a large mixer, combine the milk with 3/4 cup hot water. Dissolve the yeast in the milk-water mixture and allow to proof. Add the salt, eggs, sugar, and butter, and mix well. Add the flour and knead for ten minutes, adding more flour as needed. The dough will be sticky and soft. Turn into an oiled bowl and allow to rise in a turned-off oven one hour or until doubled. Punch down and allow to rise until doubled again. At this point, you may form the rolls, or, if you have time, allow the dough to rest overnight in the refrigerator (I recommend this step). Divide the dough into six sections and divide each section into seven pieces. 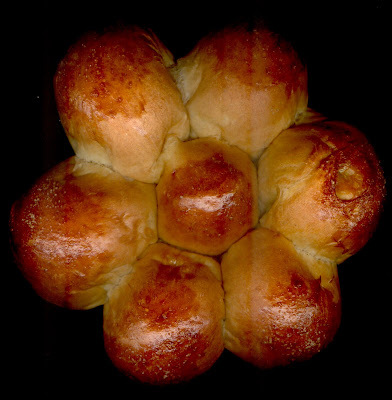 Roll each dough piece into a ball, forming a tight, smooth surface. Arrange the rolls in rosettes and allow them to proof for about 30 minutes. Brush with egg-wash if desired and bake at 350F for 20 to 25 minutes or until golden. Serve with butter and jam. Oh, I'd really like to try this. Thanks for the translation. The posting about the Topers' recipe was one of the most moving things I've ever read. I do have one comment: Is it possible that the inclusion of margarine reflected something about the time and place in whoich the recipe was used/transcribed? Namely, wartime or postwar scarcity? Perhaps butter was simply not that available? I will be interested in hearing how it comes out. yes, I did think this os probably the reason , and in fact I have seen countless milkhik recipes calling for the m-ingredient, even fairly recently. Perhaps it was health-related. At the point at which Jacob Toper died, they still thought margerine was better for your cholesterol than butter. The research showing that it was not was published in 2003, a year too late for Jacob to change his recipe. Goodness, was it that recently? I just can't believe there was ever a time when people believed margarine was healthier than butter--I remember this as being in the remotest past. I love this story - and I like the idea of leaving a recipe on my tombstone even better. Now I just need to think of what recipe I want on mine! Thanks for telling this wonderful story. leave a recipe on a tombstone? Thanks! I have to admit that is what I have been thinking ever since I saw this. Which recipe would I want on my tombstone? On 1983, I regularly attended sessions of Weight Watchers. They recommended margarine at that time. Oh, how wonderous.. to leave a recipe on your tombstone.. now I'll spend the day thinking about what recipe I'd like to leave on mine. Such an interesting question. And yes, the source of this recipe makes me want to make this as well. So very intriguing. Thank you for bringing this to us! Having lived on kibbutz (not far from Kibbutz Na'an) for many years, I can tell you that margarine was more readily available than butter (and most basic baking ingredients such as all those in the Topers' recipe were available at no cost to kibbutz members). Butter was a real luxury, expensive, and just not so available. I am sure that is why margarine was used in most milkhik recipes coming out of Israel. How luscious this looks. Thank you for posting the photo and the recipe. Mine didn't come out as pretty as yours, but it was delicious, especially when warmed up on the plata Shabbas morning. Thanks to you and Yankele. Wow! I found your blog kind of by accident. But then I had to look at my photos from when I was on Kibbutz Naan's ulpan in 1981-82. I have a picture of an older couple holding gardening implements and sure enough, the back is labeled "Mina & Ya'acov, Naan, Tu bishvat. Beth, so glad you tried this. Wow, I would love to see that picture!